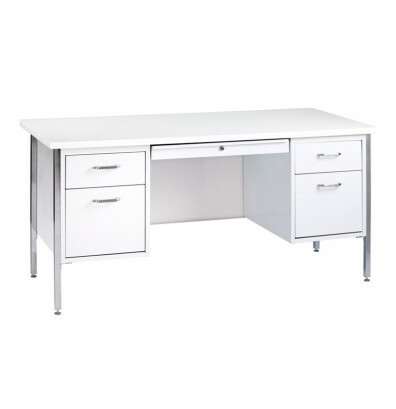 Sandusky 500 Series 60" W teacher desk offers a durable laminate top. Features two pedestals with box and file drawers. Includes a center drawer. Available in multiple finishes. 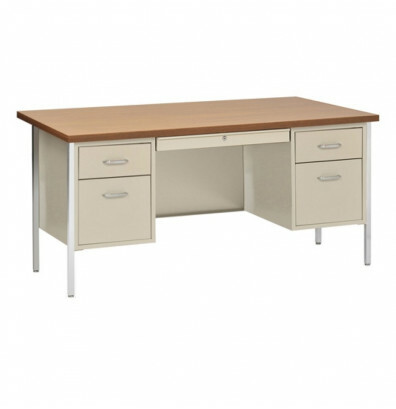 Sandusky 500 Series 60" W teacher desk offers a durable 1.25" thick wood-grain laminate top. Two pedestals have one box and one file drawer each. Box drawers are equipped with dividers and aluminum handles. Full extension file drawers accommodate office supplies and hanging file folders. The center drawer includes a supply tray. A center locking system secures all drawers. Set of two keys for locking drawers provided. Chrome-plated tubular steel legs with adjustable levelers. Minimal assembly required. 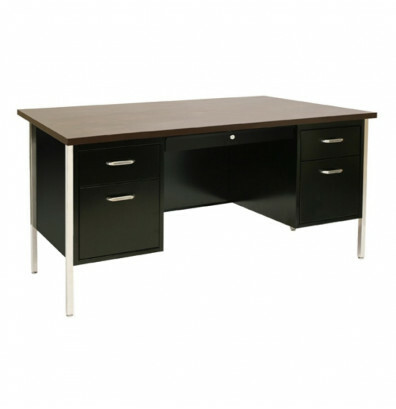 This teacher desk is available in multiple color configurations. The grey top has matching grey drawers, black top has walnut colored drawers, putty top has oak colored drawers, and white top with Arctic white drawers. Greenguard certified for low chemical emissions.